Recently, my husband and I made the long trek back to my home town in northern Maine. We try to make the trip once or twice a year and each time, I find myself battling a wide range of emotions. When I was a child, the town was a booming, bustling city that looked like it had been dropped smack dab into the middle of a sea of wilderness. Great Northern Paper Company owned the mill there and most of the forests surrounding it. Nearly everyone worked at the mill. The salaries provided were enough so that most people had a house in town, and a camp on one of the lakes, two cars per household, and yearly vacations. We had three elementary schools, a middle school, and a high school. We had an enormous recreational area with a football field, a hockey rink (with warming house), a regular skating rink, tennis courts, a track field, several playgrounds, a golf course, and a large outdoor town pool. The high school had an auditorium worthy of a Boston theatre company. Two or three times a year, we would all settle into the plush, red upholstered and reclining seats, and there, as the lights dimmed, and the curtains drew aside to reveal a spacious stage, we would watch the plays put on by the Millinocket Theatre Company, or the high school drama club. We had a movie theatre, and a bowling alley. We had department stores too, and multiple restaurants. We had all of those things, plus our town was cradled by mountain ranges and lakes so beautiful, I couldn’t do them justice with words. Our forest neighborhood offered mountain climbs, boating, swimming, skiing, hiking, snow- mobiling…you name it! 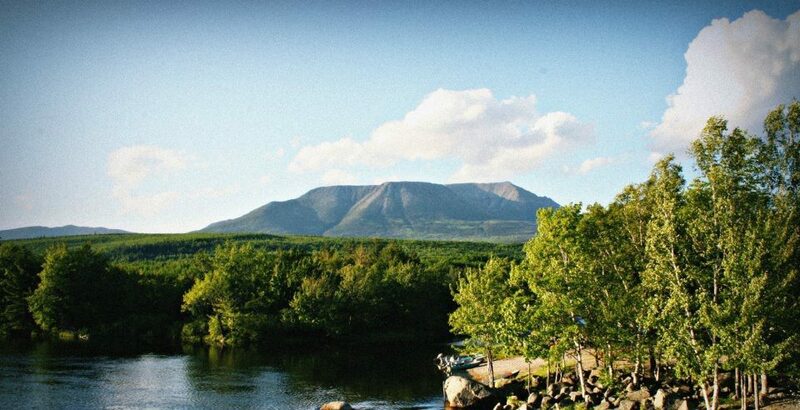 We had Baxter State Park and Katahdin, where the Appalachian Trail ends. We were rich in every sense, but not immune to hardship. We were a close- knit community, connected by so many things, and separated by very little. We struggled through harsh winters and forest fires. Through tragic deaths and illnesses. We spent years laughing and crying together. It was a town where you really knew each other and everyone’s family. It is a place, that when I visit, I still see people I know in every corner. It’s both a comfort and a heartache. After Great Northern sold, the mill began to shut down in stages. People I had known my whole life had to pack it up and move away. Stores closed, one by one. While my town still has some of the things I mentioned, it’s a struggle, I know, to keep them going. I have history there, and not all of it is good, so when I arrive, I find myself riddled with feelings. My town has changed. I have changed. My mother sold the camp I spent all my summers at. Some of my family still lives in town, but most of us don’t speak. Instead of staying with them, my husband and I stay at a hotel. It makes me sad that I can’t give him some of the wonderful experiences I had when I lived there and that he doesn’t know some of the people that used to be a big part of my life. He’s half- right. It’s not a waste of time to sit in remembrance of things loved, but lost, just so long as you don’t dwell there. It’s important to make new memories. The forests are still there. Baxter State Park and the Appalachian Trail are still there. My old fishing spots still hold trout. We even have some new things in town, like the ATV Trails. So, my husband and I will continue to go back. Hopefully, someday, he will turn to me and laugh, “Do you remember that time we…” And I will smile when I look back on how much fun he and I had in my new- old hometown.